Portability and convenient access to technology are key features to meet the ever-changing demands of the fast-paced medical care environment. 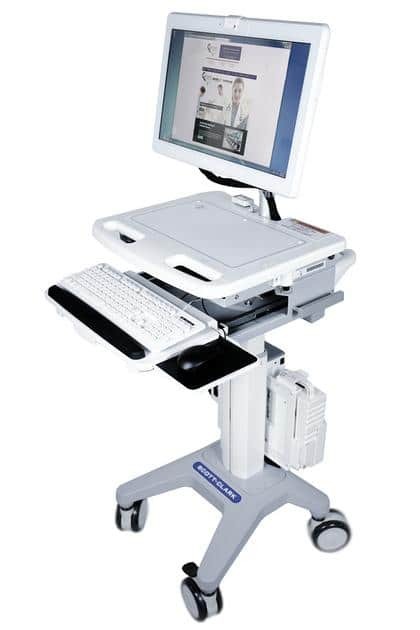 An easy-to-use, reliable mobile laptop workstation on wheels is a must to improve efficiency in a healthcare facility. If you work in the healthcare industry, you understand the need for equipment and tools that increase productivity and manage workflow processes. Healthcare workers need to move around a hospital or office easily, while still having convenient access to medical records, medical supplies, and medications. 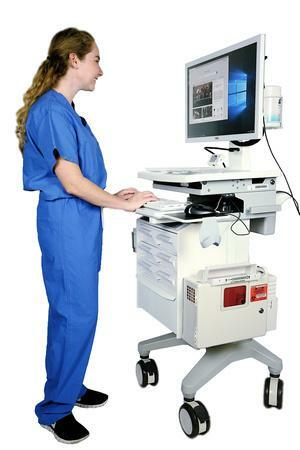 Mobile laptop carts meet all of these needs so that healthcare professionals can provide the highest quality medical care in a productive and efficient manner. A laptop workstation on wheels from Scott-Clark allows medical care professionals an easy-to-use system that is portable, reliable, and designed with patient care in mind. The laptop workstations from Scott-Clark feature the latest in cutting-edge design and technology. The lithium batteries of the workstations are long-lasting and easy to charge and change. An online battery management system makes it simple to see the battery life as well. Workplace efficiency is a priority with our laptop carts. They are lightweight and compact, making them easy to maneuver in tight spaces. Spacious work surfaces and easy-to-life monitors provide a high level of work comfort. Our top-of-the-line medical laptop workstations are composed of stainless steel and extruded aluminum, making them safe, durable, and easy-to-clean. Whether you need a point of care cart, medication cart, or a custom-designed workstation, Scott Clark offers a variety of makes and models that will meet the demands of your healthcare facility. Scott Clark is a pioneer in the medical computer cart industry, as we have developed and patented our one-of-a-kind mobile cart technology system. Our highly specialized team is ready to help you select the best laptop workstation on wheels that will suit the needs of your facility. Learn more about the Scott-Clark medical carts by contacting us today.